Sweet! 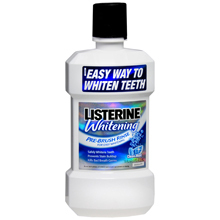 There is a new HIGH VALUE coupon for $2/1 Listerine Whitening which should help you get a GREAT deal with the right sale! Drugstore deals pop up often so be sure to print this one! Walgreens has the 16 oz bottle on sale for $3.99 now thru 3/15/14...just $1.99 after printable coupon!! *Check out more Walgreens deals here! CVS has the large 32 oz bottle on sale for $5.99 now thru 3/15/14...just $3.99 after printable coupon!! *Check out more CVS deals here!